During Fall 2017, the SMMTC volunteer trail crew undertook a major trail restoration project on the Upper Sycamore Canyon Trail in Point Mugu State Park. An intense rainstorm in December of 2014 severely damaged this section of the trail. The damage consisted mainly of a washout, occurring when a large volume of water cascaded down a steep slope, eroding away a section of trail including a set of rock steps. In 2015, our trail crew performed some temporary repairs, which were suitable for hikers, but did not resolve the hazardous conditions for equestrians. 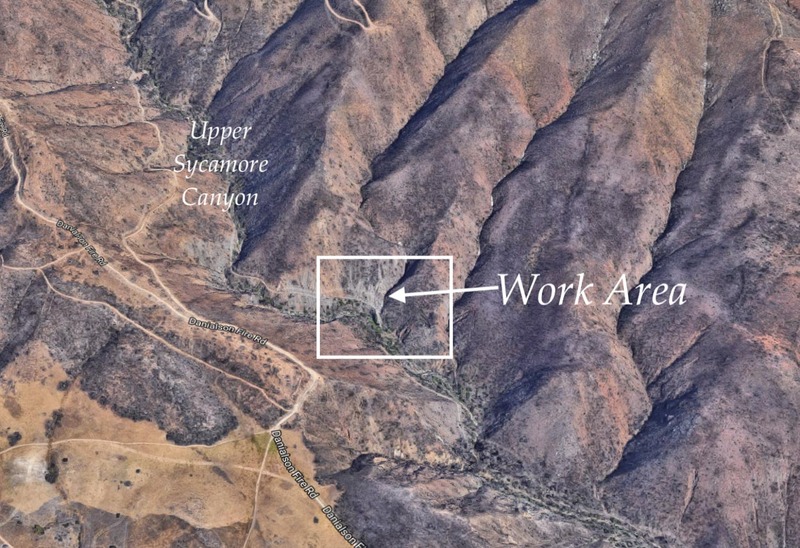 Several months ago, members of the Santa Monica Mountains Trails Council Trail Crew developed a conceptual design to restore this section of trail. The plan, approved by local authorities, required additional approvals from other agencies. All concerned agencies approved this plan. Several Tuesday/Thursday workdays were added to our regular weekly trail maintenance schedule to accomplish this project. The work began in late October and extended well into November. The project started with the clearance of dead trees and other debris from the trail and the surrounding area. The major part of the project began with the construction of a large, dry masonry retaining wall. Only local materials (rocks and soil) were used to backfill behind the wall to develop a smooth, unobstructed trail tread. The final phase of the project was installing water diversions and other improvements above the damaged area to reduce future water runoff from damaging the trail. This project required an immense effort from our volunteer trail crew, over and above our already busy schedule. Now completed, the project will result in a safer and more pleasant experience for all trail users. Future maintenance will be required to adapt to seasonal flows of water. We invested 264 hours of labor on this project!